Templater turns the arduous task of customizing video content into an elegant workflow solution. Users automate AE project customization with a simple interface that transforms text, footage, and solid layers into dynamic elements. Templater is design aware, automatically adjusting dynamic elements to produce a finely crafted result just the way you like. Templater was made to improve the process and workflow of producing targeted video based on various external data sources. As organizations mine and store more information, they need ways of leveraging this data to create meaningful connections with customers in markets across the world. Big data can drive media content, but video producers need a way to easily insert information into custom video without tediously replacing assets. 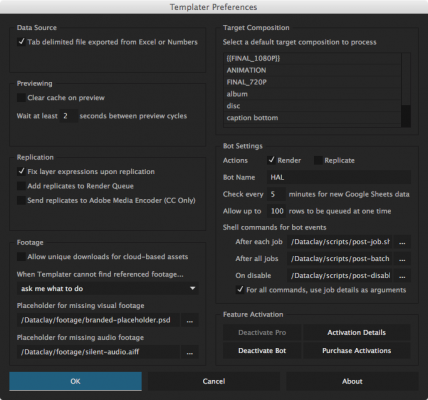 Templater 2 is available in three separate editions—Rig, Pro, and Bot. Each ships with a specific feature set. Read our handy descriptions below to see which edition or combination of editions is right for your organization. Learn more about Templater Pro and Templater Bot on their respective catalog pages. 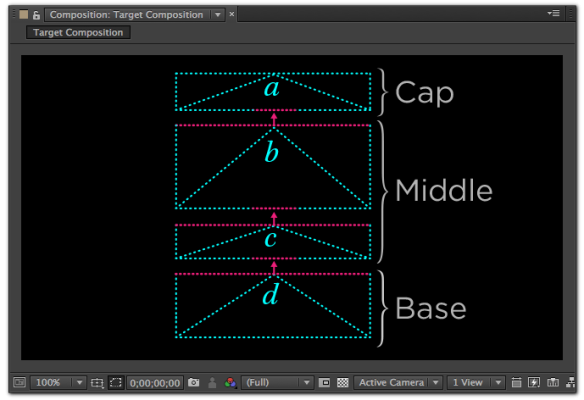 An effect plugin and a ScriptUI panel are installed into AE. 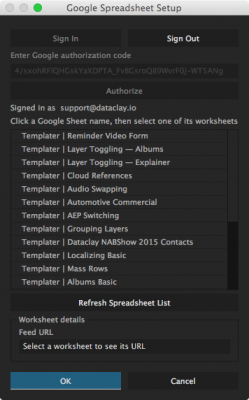 Users feed customization data into After Effects from a data source. Templater can read Google Sheets documents, JSON object arrays in text files, or tab-separated value files. Users tag layers as dynamic with the custom effect and map data to those layers. For each row in a spreadsheet or object in a JSON array, Templater updates each tagged layer with its mapped data. Templater's layout engine automatically adjusts dynamic layers to produce a finely crafted composition that is either rendered or replicated. Users take advantage of either Templater's graphical user interface or The Bot and its command line interface to achieve results. 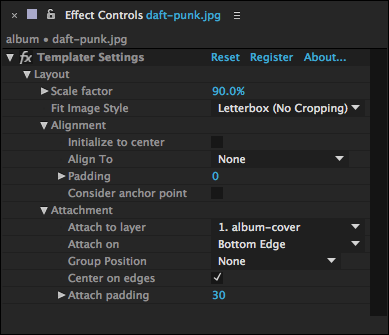 Post production pros, application developers, motion designers, marketing automation gurus, web developers, artists, and anybody using After Effects as a central part of their workflow will find that Templater increases their productivity. Whether they work in television news or live event control rooms, post-production houses, or their own private studios, Templater users work smart hours rather than long hours. @DataClay Awesome Product! Just saved me HOURS AND HOURS OF WORK. Can you make it so when I send stuff to AME, it labels it with the ID? Lester Banks, fifteen year veteran instructor in computer graphics, lesterbanks.com. @DataClay Nice work! People are going to love this utility. Shout out to @DataClay for some of the best customer service on the planet. Resolved an issue for me in less than an hour. Templater is relieving a major bottleneck in post workflows that want to embrace live data inputs with beautifully constructed motion graphics projects. It is not only saving people time but allowing content creators to spend more time on the story and finesse their design, allowing for a better end product. This Templater script on @aescripts is brilliant. http://t.co/f5xI3xRP0j @dataclay created a huge time-saver for data heavy projects. #Wow. Templater Rig gives you the tools to prepare an After Effects project file for dynamic content. Map data to your composition layers and preview how those layers change as information from the data source is processed. You are currently viewing the Templater Rig catalog page. 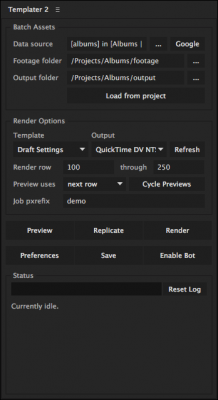 Templater Pro extends Templater Rig by offering desktop automation, allowing you to render or replicate batches of versioned compositions using data from your data source. Templater Bot is an enterprise solution for custom video on demand. It works as an automated system. Use it to periodically check for incoming data, pull new data in, and render video as a background process. Or use the command line interface to push data in to create new renders. Once your AE project is prepared, use Bot to customize and render it without operating the After Effects user interface. Developers can create front end applications, such as web or mobile apps, that feed data into Templater's data source, offering a collaborative, custom video content creation solution. Which edition or combinations of editions do I need? You find that swapping content in your project files takes too much time. You want to create an AE project compatible with Templater Pro to sell or distribute it as a template. Your clients have a database of customer information, and they require a quick turnaround for many unique videos based on that data. You have purchased a Templater-compatible AE template and want to create many unique versions of it quickly based on data from a data source. You need an efficient way to create anywhere from 15 to 15,000+ unique videos based on a data source. You want to automatically create a video based on web form input and run a script to upload it to a server. You want to integrate Templater into an existing automated production pipeline. You need to automatically run a script after every render job or after all render jobs are complete. 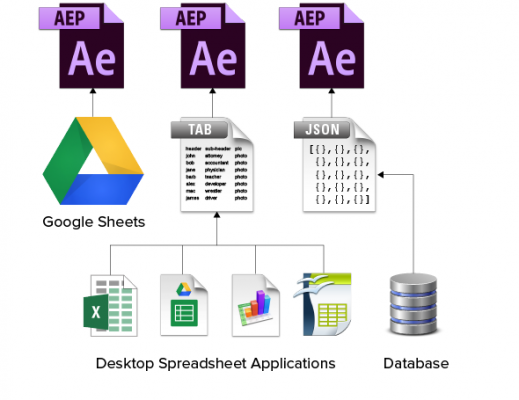 Map your spreadsheet or JSON data directly into AE composition layers. Use Google Sheets in the cloud or tabbed-separated-value files exported from Microsoft Excel, Apple Numbers, or Google Sheets. You can also use a plain text file containing a JSON object array exported from your own app. 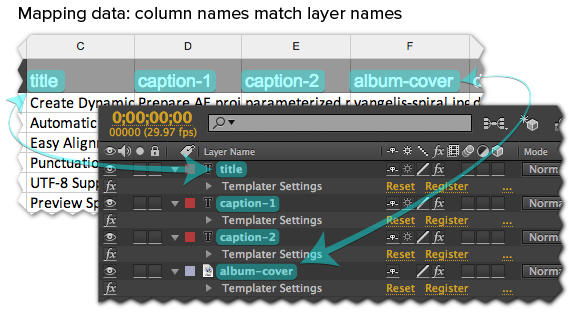 When updating an AE composition with your data, Templater intelligently adjusts dynamic layers relative to their containing composition and other sibling layers. 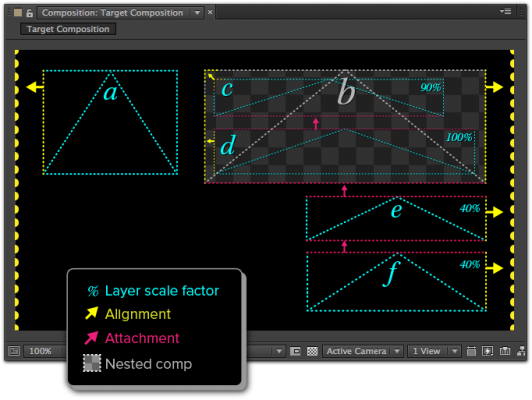 No need to futz with aligning, scaling, or positioning dynamic layers—let Templater craft your composition according to your layout rules. Use time-based rules to crop, trim, shift, and stretch layers using Templater's patent-pending Time Sculpting feature. There's no need to worry about integrating footage sources of varying duration into a video template. Now Templater can maintain the design integrity of your video while processing footage of different lengths. Insert characters from any language into your spreadsheet and see them appear in your text layers. Of course, installed fonts should have the glyphs you require. Templater reads your text as it appears in your spreadsheet, so commas, quotes, apostrophes, and new lines are accepted. Right-to-left scripts are also supported. With a click of a button, preview how your data-driven compositions will look prior to rendering or replicating. 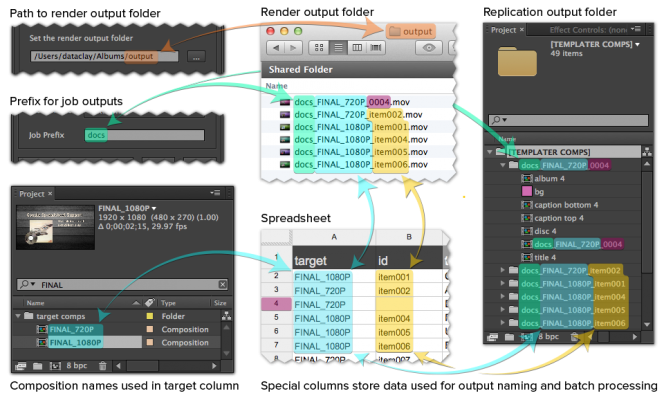 Iterate through previews of your render jobs to see how Templater treats different text, footage, and colors. Resolve problematic data quickly and effectively. Pro & Bot Only — Templater churns out many unique renders very efficiently. Choose to render all the rows in your spreadsheet or just a range. You can apply AE output modules and render settings templates to batch jobs and customize output names. Pro & Bot Only — Templater can quickly re-version a master composition with your data and replicate it so you can work your mograph magic on it before rendering. Replicated comps are kept tidy and organized within a clean folder structure. You also have the option to send replicated comps to AE's render queue or the Adobe Media Encoder. Bot Only — The Bot for Templater operates After Effects for you. When The Bot finds new data, it triggers Templater's customization and rendering process. Developers can create web or mobile apps that feed data into Templater's data source, offering a collaborative, custom video content creation solution. In addition, you can use shell scripts to automatically handle post-rendering tasks. Bot Only — Engage with Templater processes through shell commands. With the command line interface (CLI), developers have unparalleled flexibility for integrating video versioning within their existing pipelines or systems. Most controls found in the Templater Panel are configurable via a command line options file. Want to know what Templater is doing at any given time? Inspect its log files for full transparency. Troubleshooting Templater has never been easier. Templater switched to a new licensing system starting with version 2.6. This means you will need a new license code to use it. Please refer to this FAQ for assistance. Good documentation is essential for a smooth user experience. We've done our best to ensure ours is as thorough and as clear as possible. Should you encounter any problems, visit Dataclay's support site to search through our extensive online help. Learn basic concepts and follow step-by-step instructions to get started. We also have many screencasts which you can find in the Videos tab on this page. Screencasts show many different techniques and real-world examples using existing templates. While some demonstrate with Templater 1, they are still relevant to Templater 2. Use the screencasts in combination with the documentation for the most effective learning experience. If you have difficulty getting Templater to work for you after searching the documentation and reviewing the screencasts, we are here to help. Dataclay provides technical support via web and email to registered owners of Templater licenses through the help-ticket system here on aescripts.com. Submit a ticket with your question, and we will respond within three business days. For pre-sales questions, feel free to use the comments tab on this page. © Copyright 2013–2017 Dataclay, LLC. All rights reserved. with pre-comp layers marked with the Templater Settings effect. that event in the "Register Shell Scripts with Events" dialog. out bugs with their implementation of JSON footage items. > Open Recent" menu with paths to those replicas. processing that file without closing it first. + Fixed an issue that caused Templater to hang during data retrieval while using the Preview task. The bug would manifest if there was no target composition set when Previewing. 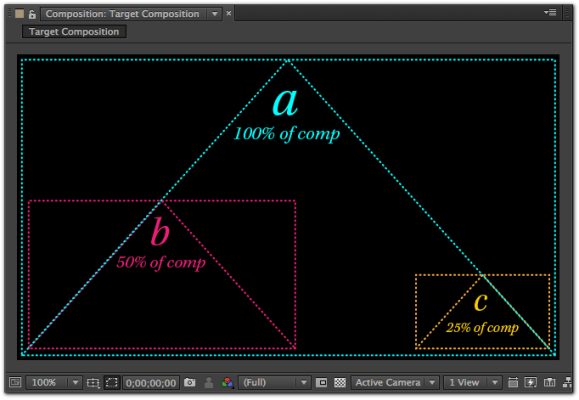 A target composition no longer needs to be set to begin Previewing. + Fixed an initialization bug that would sometimes prevent Templater to start on macOS. + Updated documentation to reflect new event architecture as implemented for both graphical user interface and command line interface. cast tutorials to learn more. from all editions of Templater include Rig, Pro, and Bot. aescripts + aeplugins you will need to acquire new products keys.